Many people can relieve symptoms of GERD by changing habits and making small lifestyle changes. But if symptoms continue or interfere with sleep or work or other daily activities of living and are not relieved self-care measures, more comprehensive intervention is absolutely necessary. That is because chronic GERD can often cause serious complications. Inflammation of the esophagus caused by the stomach hydrochloric acid may lead to bleeding or ulcers. The scar tissue can narrow the esophagus causing esophageal stricture, making swallowing difficult. Some may even develop Barrett's esophagus where the cells of the esophageal lining become abnormal in shape and color and over time may lead to cancer. Also, studies have shown that asthma, chronic cough, pulmonary fibrosis may be aggravated or even caused by GERD. There are several types of medicine available for the treatment of GERD and the aim of the treatment is to reduce acid production and reduce the LES pressure. (1) Antacids like Maalox, Alka-Seltzer, Mylanta, Rolaids, and Pepto-Bismol are usually the first drugs recommended for mild symptoms of GERD. Most of them contain a combination of three basic salts-magnesium, calcium, and aluminum with hydroxide or bicarbonate ions to neutralize the acid. Antacids are good for occasional bouts of acidity but long-term use leads to many side effects like diarrhea or constipation. Those with magnesium may also lead to dementia in patients with renal failure. (2) Foaming agents such as Gaviscon cover the stomach contents with foam to prevent reflux. (3) H2 blockers such as Tagamet HB, Pepcid AC, Axid AR, and Zantac impede acid production. They provide short-term relief but should not be used for more that a few weeks at a time. Many people benefit from taking H2 blockers at bedtime along with a proton pump inhibitor. They are effective in relieving symptoms of acidity. However, they are known to interact with other drugs and it is important to consult a doctor before taking them. Occasionally, they may also cause central nervous system toxicity. (4) Proton-pump inhibitors like Prilosec, Prevacid, and Nexium are extremely effective in reducing acid production of the stomach. They are better at healing esophagitis than H2 blockers, have a longer lasting effect and can relieve symptoms in almost everyone who has GERD. But there is a significant relapse in both symptoms and esophagitis after stopping the drug, which leads to a long term dependency. (5) Prokinetics strengthen the LES and causes the stomach to empty out faster. However they have dangerous side effects like cardiac arrhythmias are generally not prescribed. In fact, some like cisapride are no longer available in America. Decreased acid production causes an overgrowth of bacteria in the stomach. When the gastric acid levels are low a hormone called gastrin is released leading to stimulation of stomach acid producing cells causing hyperplasia. Moreover, using antacids or acid blockers begins a vicious cycle. When the acid is neutralized, the LES is weakened. This allows the small amounts of remaining acid to slip past and irritate the esophagus. If medical therapy fails, surgery known as fundoplication is recommended. Though effective in about 50% to 90% of patients its long-term efficacy is still under doubt and some continue to have symptoms or develop new problems such as bloating, difficulty is swallowing etc. All these treatments aim at treating symptoms. 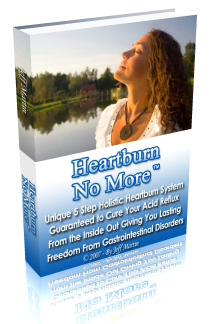 But to lead a symptom-free life it is essential to eliminate the cause of GERD. This requires the services of a holistic health practitioner who will not only treat the physical symptoms but also achieve balance between the physical, emotional and mental health.